In today’s free video tutorial, we are sharing a simple Wedding Dress in Buttercream cake design that would be perfect for bridal showers! We are also demonstrating a beautiful piped buttercream design around the sides of the cake. The piping looks much more difficult than it actually is! I love it when that happens! 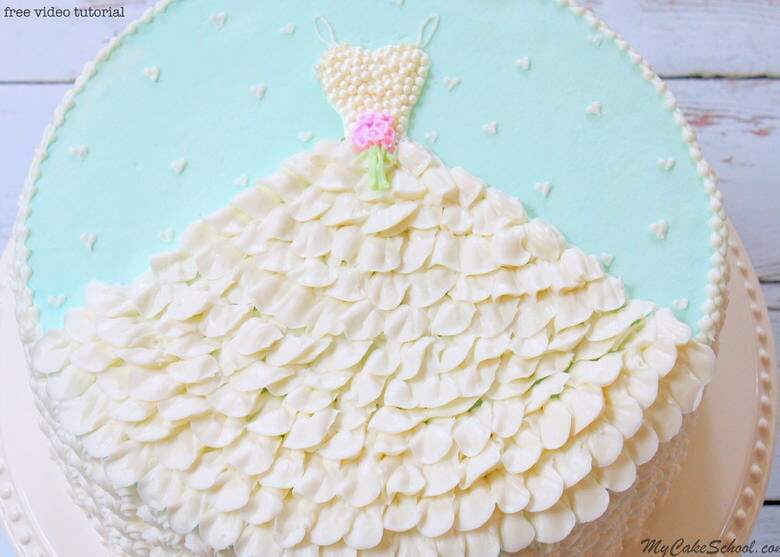 I love the layers and layers of buttercream ruffles that make up the wedding dress. As far as I’m concerned, there’s no such thing as too many ruffles! Not only are they beautiful, but with a simple petal tip, you can create rows of ruffles in a matter of minutes! 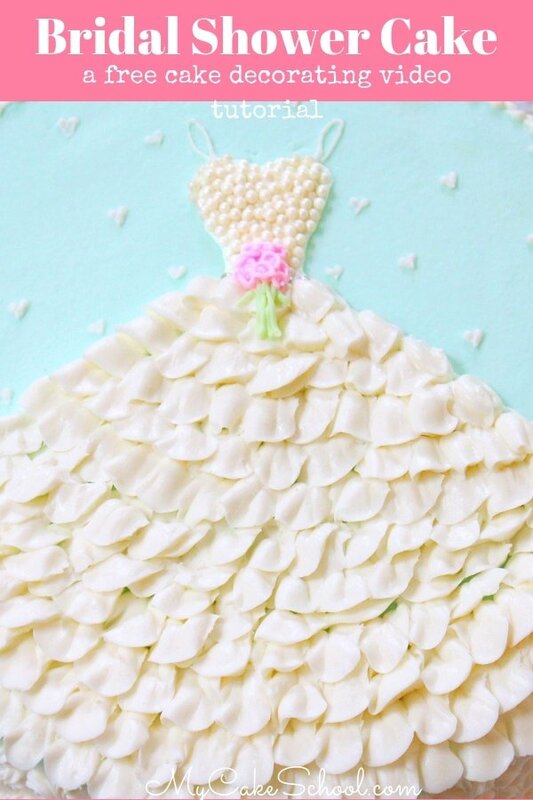 This wedding dress cake design would be a great choice for all skill levels of cake decorating! We hope that you’ll give it a try! 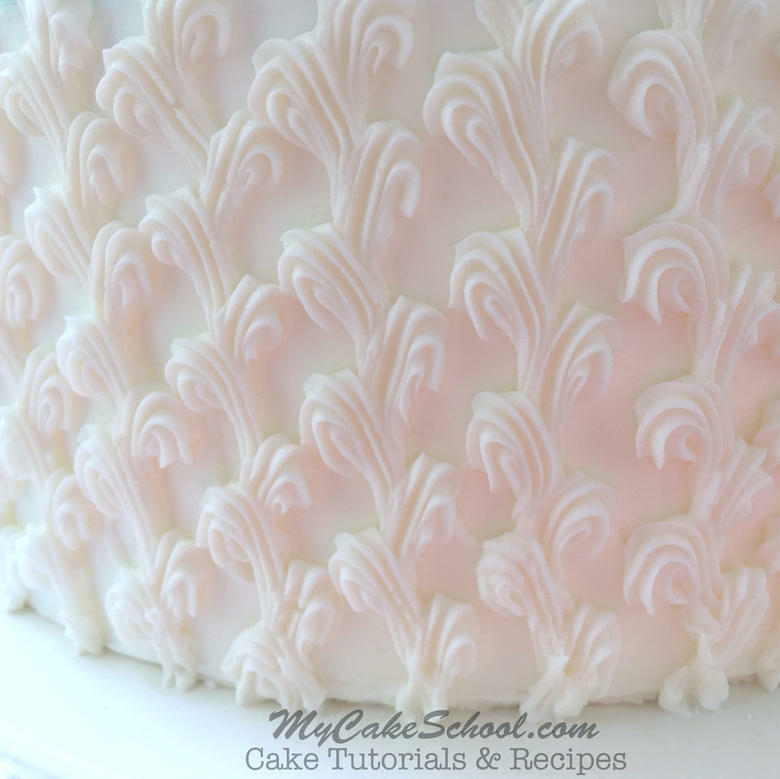 *This simple technique can be easily altered to suit your piping style. For instance, if you’d prefer rosettes piped with a star tip instead of ruffles, that would be beautiful too! 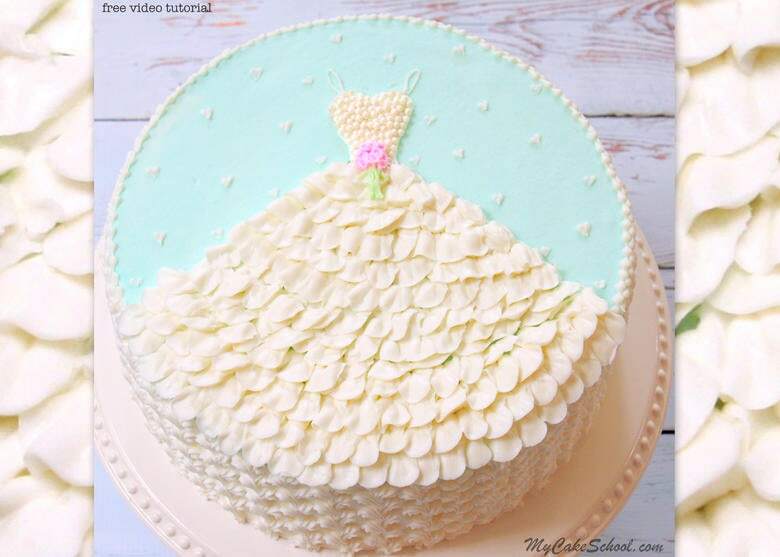 Finally, keep this tutorial in your decorating bag of tricks for a princess theme– in a different shade of buttercream, this frilly gown would be perfect for a princess! In this tutorial we decorated a two layer 10 inch cake, frosted with our Fluffy Vanilla Buttercream Recipe. Coloring Gels: Green: We used a combination of Americolor Avocado Green & Wilton Leaf Green. Viva Paper Towel: We used for smoothing our crusted buttercream. We hope that you enjoyed the tutorial! Melissa that is absolutely gorgeous. My little 5 year old granddaughter would love. You know she thinks she is a “Princess”. This is so beautiful!! This design could be used for so many different “girly” cakes! LOVE LOVE LOVE! Thank you for the video. The piping on the side of the cake is elegant. The dress is beautiful! Wow, lovely. Thank you so much ! Thank you for the video I loved this cake, it´s amazing how simple and elegant . I really enjoy these classes, I will practice this sample as soon as I can.